In today’s hurry up and get it done world, spending a huge amount of time waiting on something to cook is not a high priority. That’s where countertop convection ovens can make a huge difference in the operation of your kitchen. A convection oven can cut cooking time by up to 25 percent. It can cook at a higher temperature, as much as 30 percent higher than a standard radiant oven. 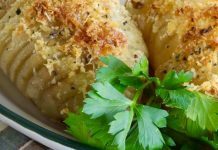 A good convection oven cannot only cook your food faster and more thoroughly, but it can also perform a variety of cooking methods, from roasting to just keeping it warm. Convection ovens are named for the circulating effect that internal fans have on the heated air inside the oven. These are commonly referred to as fan ovens. A traditional oven uses heat radiated from the walls and heating elements, either electric or gas powered. A convection oven uses internal fans to spread hot air in a continuous cycle. This cooks food faster by creating a uniform, even temperature over every surface. Because of this, there’s no need to worry about the bottom of food burning before the upper portion is cooked thoroughly. In addition to the even temperature, using a convection oven allows you to prepare any dish that can be done in a conventional oven. Food from a convection oven will have a more natural taste, be crispier and maintain its natural juiciness. Although the initial cost of a convection oven may be higher than a conventional countertop cooker or toaster oven, a convection oven will consume less energy than its counterparts. For cooks who don’t want to give up their traditional larger ranges or wall ovens, a carefully selected countertop convection oven is the solution. What features are best in a convection oven? If you’re considering getting a countertop convection oven, there are specifics to consider before making a decision on which oven to buy. Foremost is most consumers’ minds is energy efficiency. Check the unit’s heat and energy efficiency ratings. The top countertop convection ovens should run at a lower wattage rate than wall or built-in ovens, and should produce high maximum temperatures. Measure the dimensions of the oven. Will it fit in the space you’ve allotted on the countertop? Pay particular attention to the features it offers, such as rotisserie setting and whether it will hold a standard or large sized pizza. Are there multiple racks? Do the racks adjust? If they are in a fixed position, determine if the cookware you have will fit inside the appliance. Adjustable racks eliminate this problem and offer increased convenience. Also, cleanup is a lot easier when the racks are removable. Cleaning the convection oven is a big deal; rather, the ease of cleaning it. If it isn’t easy to clean, you may want to consider checking out another brand. Check to determine if any of the oven’s parts are suitable for the dishwasher. This is a definite plus. Check the appearance and style of the oven. Will it blend well with the design of your kitchen? Of course, the discerning shopper will closely scrutinize the price. A convection oven is generally higher priced than a simple toaster oven or countertop baker. Different models carry with them varying retail costs, so price shop around for the best countertop convection oven at the best price. This model is, hands down, probably the best on the market at the moment. It has garnered rave reviews all over the Internet, from Amazon.com’s customer reviews to Consumersearch.com. Professional reviewers and owners alike are quick to sing the praises of this countertop convection oven. From the nine factory pre-set functions to the easily readable blue LCD back-lit screen, this unit is well constructed, sleek, classic looking, and has all the bells and whistles you can want. The Breville Smart Oven includes Element IQ technology. This innovative feature allows for a more accurate regulation of the heat, which is the key to successful convection oven cooking. Its five quartz heating elements ensure fast preheat and even cooking temperatures, and the three easily positioned racks provide the versatility you want for cooking just about anything. But it gets even better. The Smart Oven feature means the 1800 wattage can be adjusted to facilitate a wide range of cooking options. The Element IQ system works like an adjustment switch on a light fixture, increasing the wattage or decreasing it as needed with the ease of turning a knob. The heating elements in the Breville BOV800XL are composed of quartz. This allows the unit to respond more rapidly to a change in the heat requirements, unlike metal elements found in other convection ovens. The interior walls are treated with a nonstick material that makes cleanup a snap. For those who favor a little quirky feature in their appliances there’s the magnetic rack ejection system. This patented gizmo gives you magnets on the sides of the door that pull the wire rack halfway out of the oven when the door opens. This makes it easier to access the interior and prevents those annoying little burns we all get when we remove things from an oven. This Cuisinart makes the best countertop convection oven list because of its unmatched steam feature. The application of steam can cook food up to 40 percent faster than a conventional oven. 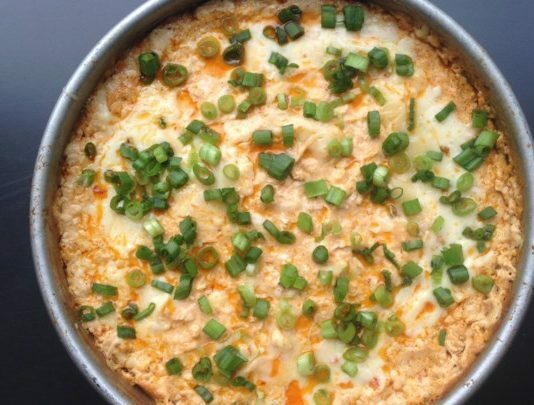 Reviews of this unit focus on its exceptional job of cooking breads, rice and meats. The steam feature is especially good for heating leftovers. It keeps food moist to prevent dryness. It doesn’t match up quite as well to the Breville BOV800XL in the broiling and roasting category, however. You do have to be careful of where you place the unit on the counter. The steam is vented through the rear of the oven. Whatever is behind the cooker will be streaked with water vapor, like a shower door after a hot shower. Also, the top of the oven gets hot when in use so don’t plan on using the top as a storage space unless you don’t mind clearing it every time you cook something. But it is an easy unit to use and has a classy, high-end appearance. The size is a nice feature, as well. It will hold a whole chicken, up to about 4 ½ pounds, or accommodate a 12-inch pizza. It will hold up to 47 ounces of water in the removable water reservoir. This provides up to 120 minutes of uninterrupted steam, which is great if you’re steaming fish or vegetables. It includes a baking pan and broiling rack, and there is a drip tray that’s removable for easy cleaning. To clean, you set it to steam with the unit empty of food. The steam will loosen any food stuck to the sides or racks. You can then simply wipe it clean with a cloth. No mess, no fuss, no fumes from cleaning sprays. You don’t get the auto-eject racks like in the Breville BOV800XL but the racks slide in and out easily. This countertop convection oven is made with stainless steel and has a sleek, smart, contemporary look to it. It has nine pre-set factory memory settings that allow variety in your cooking specifications and help get the exceptional cooking results you expect from a convection oven. It includes Asado Roast settings that will adjust temperatures as needed to ensure excellent roasting performance. From pizza crusts that are crisped to perfection to bagels that are golden brown, the baking capability of this convection oven ranks with the best of them. It features a 12-inch capacity, so it is big enough to handle most cooking needs. It includes a ‘keep warm’ setting and memory settings for reheating. It also includes a 60-minute timer for those more involved culinary undertakings. The interior is coated with a nonstick lining for easy cleanup. The display is digital, showing temperature and cooking times. The temperature adjustments are knobs that turn easily. When in use, the top does get warm but this can be used as a method of pre-heating dishes before serving. The three racks include a round attachment and there is a handy rack guide for help in selecting the best position for various types of dishes. 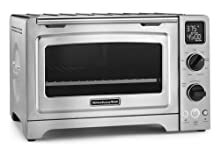 Breville Smart Oven with Air Fry, Brushed Stainless Steel has the numerous features and extras which make this a well-made, versatile unit in the top five countertop convection ovens available on the market today. An air frying function, two-speed fans will help you prepare crispy foods and control cooking as well. Breville Smart Oven also is accompanied multi racking option which allows you to use the space in the countertop oven however you want. 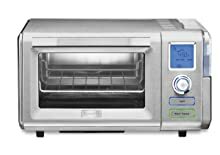 For cooking and baking quick foods, this Oven has 13 cooking menu functions that you will be able to choose any given moment, including toast 9 slices, broil, bagel, slow cook, cookies, reheat, roast, pizza, warm, bake, air fry, proof, and dehydrate. One cubic foot is this Breville countertop oven’s capacity, which is exactly 16″ x 13.5″ 7″. You can bake a 14 lb turkey, but also fit 9 slices toast or12 muffin cups. At once time, you can fit 4 racks and cook at all of them. The interior is big enough, and the heating elements certainly do not interfere. Especially, this countertop convection oven comes with a wide array of free accessories, including 13″ pizza pan with non-stick coating, 2 heavy duty racks, broil rack, enamel roasting pan, and air fry/dehydrating basket. You can save your money, lots of cooking time and your energy also. The most prized feature of this oven is the easily- cleaning setting such: nonstick interior provides flawless food release and easy cleanup, pull-out crumb tray lends convenience. 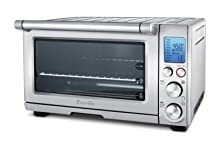 This sleek Breville convection toaster oven has you covered when it comes to making an array of delicious meals. 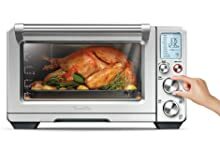 A really large countertop toaster oven that could be really useful for family gatherings? 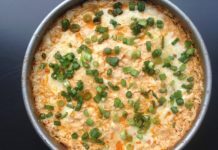 This is the reason why the Oster Extra Large Digital Countertop Oven rounds out the top five list of best countertop convection ovens. With the extra-large interior, this oven comfortably accommodates two 16 inches pizzas, a large casserole, roasting and baking pans, family sized chicken or 14 slices of bread in one patch. This is really a great choice for a big family breakfast. Cooking a meal in the Oster TSSTTVDGXL is super-fast and delicious dishes because of not only a large interior but also turbo convection oven technology. The turbo function speeds up your cooking time up to 3 times faster than your regular oven. Additionally, this feature potentially cut up to 50% of your energy used to cook. The heat inside the cooking chamber is spread so that you can expose all parts of the meal to the same cooking temperature. Food still remains moist rather than completely dried out with the heat. 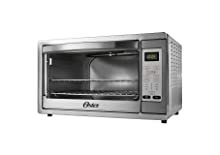 The Oster Extra-Large Oven comes with free accessories: 2 oven racks, durable bake pan, and integrated broil rack. By contrast, you would be required to purchase these two oven racks separately with other models. The two racks make you possible to do multi-level cooking simultaneously. Made from stainless so that this oven is not only durable but also makes your kitchen look rather modern. Cleaning the Oster TSSTTVDGXL Extra Large Digital Countertop Oven is really convenient. The crumb tray is removable so you can easily collect any loose particles that might have fallen out of your foods. And, it also makes cleanup easy. The interior walls quickly wipe when finished cooking. It is not a hassle to clean racks and cooking pan. Also, the exterior is sleek and not easily be covered with dust and dirt. Owning a convection oven is the best way to increase the speed and quality of your cooking. With today’s countertop convection ovens, you’re able to get all the benefits of owning a convection oven without taking up a lot of space. Here you have the best-recommended convection ovens before you and all the knowledge you need to make the rightest choice. It’s all about knowing yourself, knowing your kitchen, and knowing your cooking habits. Regardless of your budget and your requirements, you will surely have something to look among. They are different in both their prices, designs, and functionality. After reading about the top-rated convection ovens, and consulting the buyer’s guide, you should be ready to find the appliance that is perfectly suited to your unique needs.